Cook tender coconut in ½ cup of water. Add ¾th of the milk to it and boil. Add sugar. Mix well and let the payasam thicken. Combine corn flour with the remaining milk. Add this to the payasam. Add cashew nuts and raisins roasted in ghee to it along with cardamom powder. Mix well and serve. 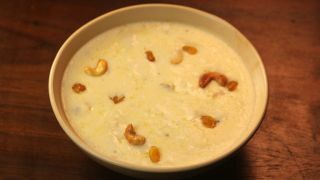 Tasty payasam is ready.